A lot of the time, you'll hear people that claim music theory is not important, or maybe even that it stifles creativity. Often cited are case examples such as Paul McCartney's inability to read sheet music. While it is absolutely true that music theory is not required to write great music, for some people, it can help greatly, and introduce new ways to express oneself through music. Music theory is a set of concepts and a language you can use to communicate ideas about music with other people. The main benefits of learning about music theory are that you will be able to express musical ideas in a concise and accurate manner and be able to think about music in a structured way. Music theory is also dynamic. It looked much different 300, or even 50 years ago. What music theory really is, as all theory is, is documentation of things that happen, in this case, music! Different styles and techniques evolve over time, and they meld into theory along with everything else. A pitch is a specific frequency of sound. This frequency may be expressed in Hertz (Hz), a unit that measures cycles per second--in this case, oscillations per second of a pressure wave. Because of way the human ear and mind perceive sound, a pitch with a frequency that is an integer multiple of another pitch's frequency will sound very similar to it--for example, 440 Hz and 880 Hz. The pitches are clearly distinguishable, but seem to share a certain quality. Because of this effect, music has the concept of a pitch class: a set of pitches with the same name that are considered more or less equivalent for the purposes of harmony (for example, "C"). In music, the most common way to refer to a pitch is by a combination of its pitch class and octave, such as "A4", a pitch of 440 Hz in modern tuning. A sharp (not as in the note "A sharp" but as in the symbol ♯ commonly stylised as # in computer text) raises a pitch up by one semitone. For example the note C♯ is one semitone higher than the note C. A flat (not as in the note "A flat" but as in the symbol ♭ commonly stylised as b in computer text) lowers a pitch down by one semitone. For example the note B♭ is one semitone lower than the note B. Sharps and flats are called "accidentals". There is also another accidental called the natural ♮ which cancels any other accidental. For example if you have a key signature with B♭, E♭, and A♭ and you want to notate a B, you can put a natural sign to indicate B♮. Two different spellings that represent the same pitch class are enharmonically equivalent.
] with all the different keys that use flats and that use sharps. Using sharps vs. flats depends on what key you are in and/or what direction the notes are going in (higher or lower); only scorewriters and their text equivalents (LilyPond / MML etc.) preserve the accidentals of each note, other music software assumes a unique representation for each pitch class. Many do not even have an option to use flats instead of sharps. It is not rare for double accidentals to arise in sheet music; again, most tools are unable to represent them. In fact, most computers cannot even print them. The double sharp sign (𝄪) looks like a lowercase letter "x" with tiny squares at the four ends; the double flat sign (𝄫) is simply two flat signs sticked together side by side. In Germany and some other countries, B actually represents what is known as B♭ otherwise, and H is used for B. The H is seen in RASTER Music Tracker, for example. The value of a note is an expression of how much time it occupies. A quarter note / crotchet is a quarter of a common time measure (see below). As an example, a 7/4 measure can hold seven quarter notes, while a 2/4 only two. A half note / minim is twice the length of a quarter note. A whole note / semibreve takes up an entire common time (aka 4/4 time) measure. An eighth note / quaver simply takes up half the time of a quarter note. A sixteenth note / semiquaver, as you might expect, is half the length of an eighth note. In many trackers, the defualt speed settings assume that each row spans exactly the duration of a sixteenth note. In sheet music, adding a single dot after a note increases its duration by half; thus, a dotted quarter note means a note with a length or value of a quarter note plus an eighth note. A measure is a unit in music which defines the length of an arbitrary phrase, sort of like a coherent musical statement. Measures are subdivided into equal time intervals called beats. A time signature is the way to express the number of beats in a measure. The time signature most often used in Western popular music is 4/4, also called common time. 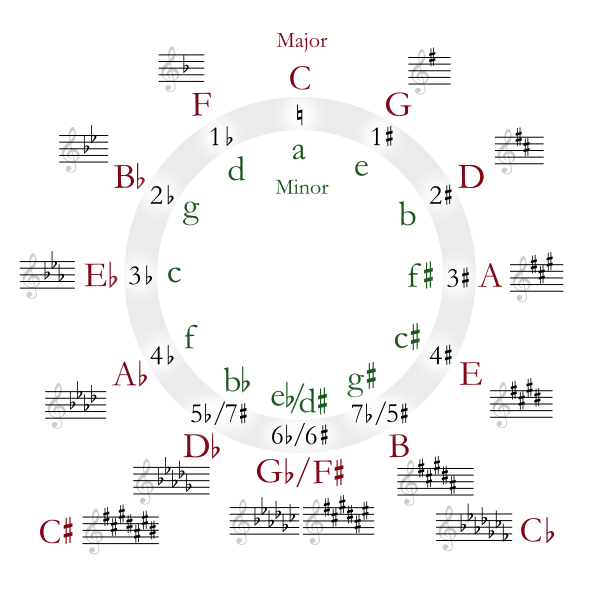 The top number in a time signature tells how many beats are in a measure, and the bottom tells what note value makes up a single beat (ordinarily a quarter, eighth, or sixteenth note). A time signature is NOT a fraction--3/4 are 6/8 denote two different meters (by convention, 3/4 denotes a measure split into 3 quarter-note pulses, and 6/8 denotes a measure split into 2 dotted-quarter-note pulses). Simple time: Time signatures where the main beat is split into two equal parts are referred to as "simple time." The most common types are 2/4, 3/4, 4/4 and 3/8. Compound time: Time signatures where the main beat (top number) is split into 3, not 2, equal parts, so that one beat would be equal to a dotted note. 6/8, 9/8 and 12/8 are the most common compound time signatures. Irregular/Complex time: This is when there are a certain number of beats in a measure that cannot be divided into equal parts. For example, 5/4, 7/4, 11/8 etc. cannot be divided into equal groupings, and so are irregular. These sorts of time-signatures are very common in "progressive" rock, and can be an effective way of introducing "rhythmic dissonance" into a piece of music. Additive time: An additive time signature is one where a measure is composed of several specific groupings. For example, a time signature of 2+3+2/8 would specify one group of 2, followed by a group of 3, followed by another group of 2 in a bar. This differs a from simply writing in 7/8, as the groupings are specified within the bar, and so "stress" on those particular beats are required. These sorts of time signatures are pretty advanced, complicated to use, and are only really effective when writing very rhythmic based music. Irrational metres: Okay, so maybe not a "main" type of time signature, or a particularly useful one. An "irrational metre" is one where the note value of a single beat within a bar (ie. the bottom number) is something other than 2, 4, 8, 16 etc. For example, a time signature of 4/3 would mean that one bar is composed of four dotted-crotchets. These sorts of time signatures are only really used when poly-rhythms are concerned, and they're not really worth worrying about (they are almost never used). I suppose this really just makes for a nice bit of music theory trivia, I guess. Tempo is the speed a piece is played at, and it is usually measured in beats per minute. For an example, a piece at 100 beats per minute (BPM) means in one minute, there will be 100 evenly spaced beats played. Take a note. I will take C, and name it Do in solfege notation, which is a relative notation of the major (or minor) scale, any note can be Do. Let's also give the notes their scale degrees. Therefore, we are working in C Major. When a certain chord is playing, or is implied, it's a good idea for a note in the melody to be a note in the chord. Of course, this does not apply in all circumstances, or even most of them. An accidental is a note in the melody that is somewhat like a borrowed chord, in that it is not in the key the rest of the piece is written in. If I had a melody that went C, G, D, D♯, C, if that piece was in C Major, the D♯ is an accidental. Accidentals are useful, but a lot of composers (usually novices) avoid them like the plague. My advice is to experiment a lot, and see what works, and what doesn't! A motif is a certain melodic phrase that is repeated in a song, or is very prominent of said song. An example of a motif is the dramatic introduction of Beethoven's 5th Symphony. A hook is a motif that is meant to be especially appreciated and remembered by the listener, used extensively in pop, rock, and hip-hop songs. Hooks often occur after pauses in the melody, often have wide interval jumps, and have more energy expressed through them than in the rest of the song. Counterpoint is the act of playing two different melodies at the same time. These melodies are often separated by wide intervals to avoid clashing notes. A common practice is to introduce one melody first, then the other, then both at once. Counterpoint employs three types of motion, or several melodies' movement relative to each other. Similar motion is when two melodies move in the same general direction. Part 1 moves from C -> G.
Part 2 moves from E -> A♯ (upwards). Contrary motion is when two melodies move in the opposite direction. Part 2 moves from E -> D♯ (downwards). Oblique motion is when one melody moves in a direction, while another stays on the same note. Part 2 stays on E.
In counterpoint, one should usually avoid parallel fifths, and parallel octaves, which occur when melodies stay consistently on the same intervals of each other, by way of a perfect fifth, or an octave. This violates the idea of independent melodies, and generally makes them sound more like chords. Part 1 moves from C -> D.
Part 2 moves from G -> A, at the same time. Contrary and oblique motions are usually employed to avoid this. The entire section on harmony has been moved to here. By definition, percussion is defined as hitting or scraping an object to make music. By this definition, piano is soundly percussion, as hammers are used to strike strings when you press down keys. But this section is about unpitched percussion, percussion that doe not have a definite pitch, and in contemporary music, usually used to keep the beat. However, this was not always the case, as pitched instruments were usually used to keep time (such as cellos) in the classical periods. So how does this all work? I mean, on the most fundamental level, how does it really work? When something makes a sound, it is quite literally sending vibrations out from the energy produced by the action creating the sound. It sends off these vibrations through the air, where your ear picks them up. To explain we have to venture into human anatomy. In the human ear (and many animal ears in general), sound is perceived through a construct in the inner ear called the eardrum, which is very sensitive to vibration, and amplifies any vibrations received from the air, to another construct called the cochlea. The cochlea is filled with fluid, which vibrates as well. The cochlea is a tube which is spiraled up, and on one side there are hairs lining the tissue, and when these hairs vibrate, our brains perceive this sensation as sound. There is a point in the cochlea for middle C, and every pitch from roughly 20 Hz, to 20kHz. An overtone is a frequency our brain combines with a lower frequency to synthesize a new sound. These sine wave overtones, when the highs and lows match nicely, are consonant, and when they do not, they fall out of step with each other, and are considered dissonant. For example, an A5 (880Hz) has exactly two high points for every high at A4 (440Hz). These notes meld together well, and are consonant. The overtone sequence are the notes produced by diminishing ratios to a given frequency. Let's take a note, say C. A frequency that is half the length from high to high is also double the Hz. Therefore, this note is also C. What about a note which is a third the length? Turns out, this note is G. A quarter? Another octave up, C! A fifth, and we get E! Hey, wait a moment, we just deduced the major triad! If we kept going in this pattern, we would deduce the entire chromatic scale! Timbre, with pitch and tempo, are the three needed components to make music. White noise is not music, because as it contains timbre, it has no discernible pitch or tempo. Timbre is defined as the synthesis of a pitch and its overtones to create a different sound. A guitar, and a piano may play the same pitch at the same tempo, but they have different timbres. Sound design is the process of creating or altering a specific timbre. Production is the refinement of a sound or piece. Velocity is the volume at which a note is played. Attack is the rate at which the beginning of the note reaches its full velocity. Sustain is how long a note stays at its peak velocity. Decay is how long a note takes to inch down from its peak velocity. Delay, or echo, is a sound being repeated, slowly fading out. Reverberation, or simply reverb, is when a sound lingers for a bit after being made. Reverb is usually used to make electronic music sound more 'natural', or give the effect of being in a large room. Compression is the consolidation of pitch and volume in a sound to a more uniform level, not to be confused with normalization, or the (de)amplification of pitch to a certain point. Chorus is the layering of sounds on top one another. Amplification is the process of artificially making a sound louder, or seem louder. EQ, or equalization, is the amplification or deamplification of certain frequencies in a sound. Pitch Correction, colloqially known as autotune, the the act of electronically altering a voice or instrument to be on key in a piece. In a piece, dynamics are how varied a song is in volume. The act of compressing a song's volume and then amplifying it to the point of clipping, or losing data because it went over the volume threshold, has been the most controversial issue in music production for the past few decades. Scientific studies have proven people pay more attention to, and even are more favorable towards, music that is perceived as louder. Since sound cards, devices that render electronic data as acoustic sound, and speakers can only reach a certain volume, this technique is used. Many people enjoy a dynamic piece, and therefore dislike the so-called loudness wars. First of all, you need to keep trying. Don't ever give up. And try new things! Listen to new music, get out of your shell! Mess up intentionally now and again, you might do something you like! Remember, simplicity is your friend! Lou Reed famously stated that one chord is fine, two is pushing it, and three is getting into jazz! With that being said, complexity is not your enemy. Don't regret things! Regret something, accomplish nothing! People do poorly sometimes, but that's just part of the fun! http://www.youtube.com/watch?v=i_0DXxNeaQ0 - A great video explaining the fundamentals of timbre and sound design! http://musictheory.net - interactive, graphical music theory lessons! http://www.everythingisaremix.info/ - the modern Bible on the process of creation in general, with some musical examples. http://www.youtube.com/watch?v=4niz8TfY794 - A video exploring concepts of atonality and polytonality.